Machine of Death, the science fiction anthology series that incurred the wrath of Glenn Beck back in 2010, will soon be a card game. The premise behind Machine of Death is that there exists a machine that can predict anyone's death with 100% accuracy. 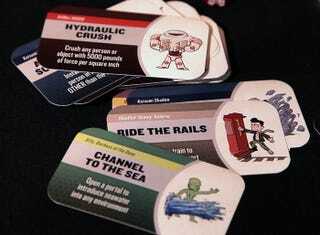 In the vein of Dixit, Pick-up Lines, and similar party games, the Machine of Death card game invites players to come up with the most original and fantastic ways for someone to die via "Banana Peel," "Sharks," "Catapults," and more. I just threw my $25 to the Machine of Death Kickstarter for a hard copy of the game, and it's on track to hit its initial target by some time tomorrow. Go grab your copy now, before there's a run on copies à la Cards Against Humanity.